A recipe for a pina colada bundt cake. 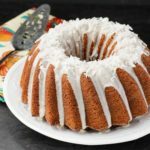 Pineapple and coconut flavors give a tropical flair to a cake baked in a bundt pan. Preheat the oven to 350 degrees F. Grease and flour a 12-cup bundt cake pan. In a large bowl, beat butter and sugar using an electric mixer on medium-high speed until light and fluffy, about 5 minutes. Add the eggs, one at a time, beating well after each addition. Add the coconut milk and rum. Beat until combined. Add the flour mixture in three additions, alternatively with the yogurt in two additions, mixing on low speed until just combined. Do not over mix. Stir in the vanilla, coconut extract, and crushed pineapple. Pour the batter into the prepared bundt pan. Bake until a toothpick inserted in the center of the cake comes out clean, about 1 hour. Cool cake in the pan for 10 minutes. Invert cake on to a cooling rack and cool completely. Place a sheet of parchment paper under the cooling rack. Pour the glaze over the cake. Garnish with coconut flakes if desired. In a small bowl, add the confectioners sugar, melted butter, vanilla, and 3 tablespoons pineapple juice and/or milk. Stir to combine. Add more pineapple juice or milk to desired consistency (should be pour-able but not too thin).